Whatsapp starts as text to text massaging app and after the great update today we send any types of documents with WhatsApp. Total 180 countries use this app worldwide. They are daily updating their services by update the surviving system. Whatsapp pretty busy this year to making a new feature for a customer. This year WhatsApp introduce group video and voice calling, payment option and sticker feature from fast 3 months. Included with Picture-picture mode swipe to replay mode. 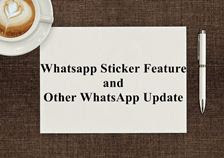 One of introduced new is sticker feature for WhatsApp. Many of other chat platforms already have a sticker feature. So that is a most awaited feature for all Whatsapp user. We don’t like to type text today, we use most emoji for use as a shortcut of text. We use text almost serious conversation, Sticker most use in festival cause no one like to forward the same picture to all. Yesterday I received most wishes on Whatsapp and I feel shocked when I see its sticker, the sticker with creative and well design. The sticker feature is one of a great way to express yourself more creative and colorful way, especially on this festive occasion. It also saves your time from typing long massage. Whatsapp already supported emoji and gif file and now stickers feature are new on the list. If you did not receive update still then go to your play store and update the app. Because sticker pack support only updated version. For use Sticker pack, first, update you WhatsApp if you not updated. Ones update open WhatsApp tap emoji you will see sticker icon next to GIF icon. There are many sticker packs available which can you update from play store, some are free and some are paid pack. Because of some fake news forwarder, WhatsApp creates a limit on message forward. Currently, we forward a message for just 5 chats. But as per new update WhatsApp now that limit increase for 20 chats. From the announcement, WhatsApp tries to make a more private feature for users. Whatsapp announced new feature allow you send private messages, especially when you chat on a group. This feature recently available on beta version 2.18.355. To use a private message, hold on message and tap three doted menu on the right corner of the app. Here you can see a private message option. Once you select all message to come in private mode. It is specially designed for quick replay to your massager for an instant response on your message. You need to swipe right to the instant the particular massage. This new feature makes to help quick respond to massage from available thread.